Just listened live to a speech of van Rompuy at an European Movement event at the Bavarian representation to the EU, and although the European Council President remained very general, he got specific in a number of areas. He underlined that he thinks we need more regulation of the financial sector. He said he wouldn't report on the details of the Task Force meeting of EU finance ministers, the Eurogroup President and the European Central Bank President regarding measures to prevent future crises (they met for the first time last week), but in the next sentence he mentioned something like a "Crisis Cabinet". He told that he wouldn't be "in principle" against Treaty changes regarding the crisis prevention, but he made clear that he preferred informal mechanisms (like a "crisis cabinet"??) over legal changes. On the question whether the Lisbon Treaty didn't bring more external voices than limiting the number, he shared his view of the division of tasks: He and Barroso represent the EU in international fora on the Summit level (heads of state and government) including at the G20, where they speak with two voices when it comes to their respective responsibilities but where they speak with the same message (which the member states would also need to learn, he added). High Representative Ashton represents the Union on "her" level, that is during ministerial meetings. He explained that the advantage of being a European Council president would be the ability to build more permanent relations (although he made fun of the fact that "permanent" means 2 1/2 years), especially informally, and that he is glad that he doesn't need to consider a national constituency during his work (as previous European Council Presidencies had to do). Sounds logic. Update: The speech is now available on video. 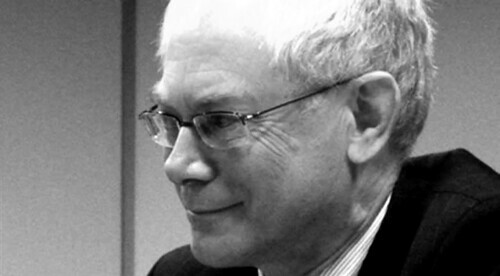 Since the EU is the EU's greatest problem, I think that Van Rompuy is the right kind of leader. Thanks for pointing to you post, and I also agree with you that HVR is kind of the right person where he is right now. I still find it hard to judge where he really is in terms of personal and institutional power and how much of this is him vs. how much is his constitutional role. The President of the European Council Herman Van Rompuy proposed a “crisis cabinet” reports Honor Mahony of the EUObserver. He said that “there is not much hierarchy or organic links between the main players and the main institutions”. European Comission President Jose Manuel Barroso, the head of the European Central Bank Jean-Claude Trichet and Mr Van Rompuy himself would be the triumverate in this “crisis cabinet”. And Honor Mahony again reports that at the same time the President of the European Commission called Germany’s plans on improving economic governance in the eurozone as “naïve”. He believes that any treaty reform is not feasible in the moment. My commentary is that a Crisis Cabinet is the Missing Link in the Eurozone Crisis debate. The May 2010 EU Finance Ministers Summit announced the foundation of European Economic Governance and waived state sovereignty. I believe The EU Crisis Cabinet could very well emerge to provide European wide policy and mechanisms for unified economic, banking, monetary and seigniorage government without Treaty reform or State Parliament approval. A currency crisis arose which took us out of the age of national independence into the age of mutual interdependence. We are now living in age of global governance where leaders meet in summit and announce policy, that is rules of governance; national sovereignty is foregone for the common good of all; then task forces develope consensus, and make further policy recommendations for final committment by leaders, who announce a Framework Agreement, which sets forth the economic, political, monetary and seigniorage rules for the region. Then stakeholders and a Council of Leaders govern and the people follow.